Look at this musical brainstorm I had while making thank you notes for Kate's piano teacher to give to her friends! And it's perfect for this week's long and short challenge at CAS-ual Fridays - one side must be longer and one shorter, but not a normal A2 (5.5x4.25) card. 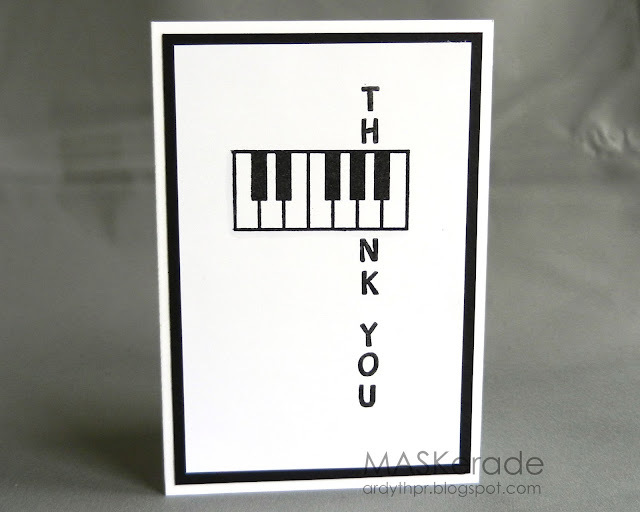 For those of you who don't know, that piano key is an A. I masked the Stampabilities keyboard and then used Lawnfawn's Harold's Alpha to create the sentiment. This is so clever, and perfect for anyone who knows their piano keys. I love clever cards... and this one is awesome! so creative...love it! Thanks so much for playing along with us at CAS-ual Fridays! This is too stinkin' BRILLIANT!! Love love love!! Hello! I've been reading your site for a long time now and finally got the bravery to go ahead and give you a shout out from Humble Texas! Just wanted to mention keep up the good job! Oh, so beautifully Ardyth! Clever once again. PS Thanks for clarifying the "A" part of the image. I have so saved this for inspiration. With a family full of musicians and all of our teachers, directors and musician friends - this idea will be CASed! This is so creative and fun! I love it. Wow you are so smart...love this idea. Such a clever card and the stamping is so dark and clear. It's wonderful! Such a unique card Ardyth! Love the black and white, perfect for a piano teacher to give her friends! Once again - cool and clever - LOVE your cards, Ardyth! AHHHH!!! You kill me ... this is SO COOL!!! Absolutely LOVE, love your clever sentiment! How many times can WOW us with a piano stamp? A million, apparently. Wow! You are a clever chick, Arydth! Absolutely love your take on the challenge. Thanks for playing along with us @ CAS-ual Fridays Challenge! Very clever card . Bet the teacher was impressed.